First off – the following recipe has No Oil, No Dairy (including cheese) and No Meat. I am just letting you know before you keep reading and then realize I am sharing a pizza recipe with no oil, no cheese and no meat. While the meat is usually somewhat acceptable to most people, the no cheese thing is usually a big turn off. Occasionally, Mr. Beet and I will want takeout pizza without cheese and every once and a while it just confuses the heck out of the person on the other end of the phone taking our order. I guess in general most people want cheese on their pizza? 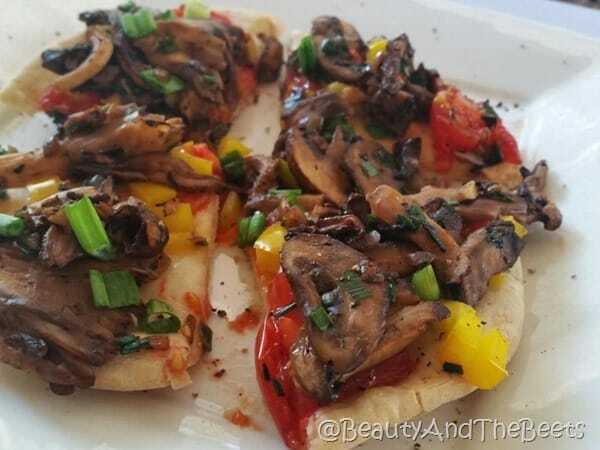 Anyway, just give this Garlic Mushroom Pita Pizza a chance here. Today’s recipe involves pita bread and veggies baked in the oven- just like a pizza. 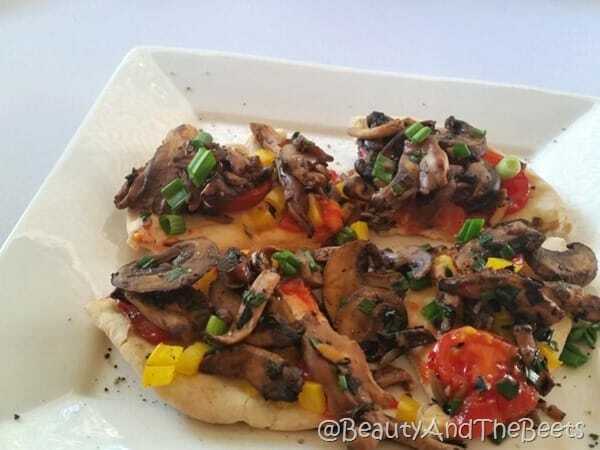 And the veggies are all simple – only tomatoes, yellow pepper (or any pepper you wish) and garlic mushrooms. So the mushrooms were made as an assignment for my Forks Over Knives class. We are currently learning how to both sauté and roast vegetables without oil. And it is interesting. 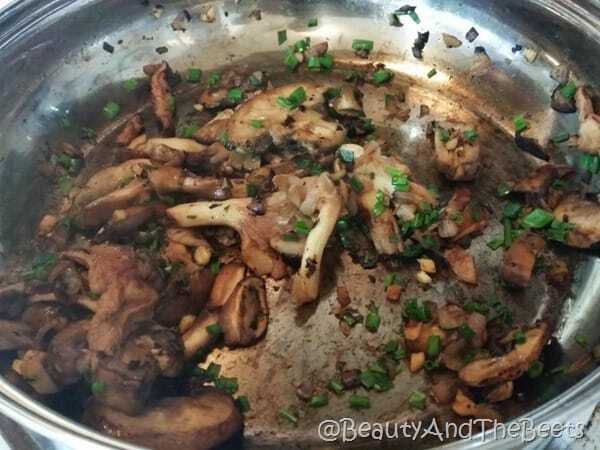 As the mushrooms begin to release their moisture and lightly stick to the pan, you add a liquid to deglaze the pan. In my case, I used blackberry juice, although the original recipe called for masala wine, and it added a slight sweetness to my mushrooms. And we loved it. Although apple juice or vegetable stock would work just as well if blackberry juice is not readily available. 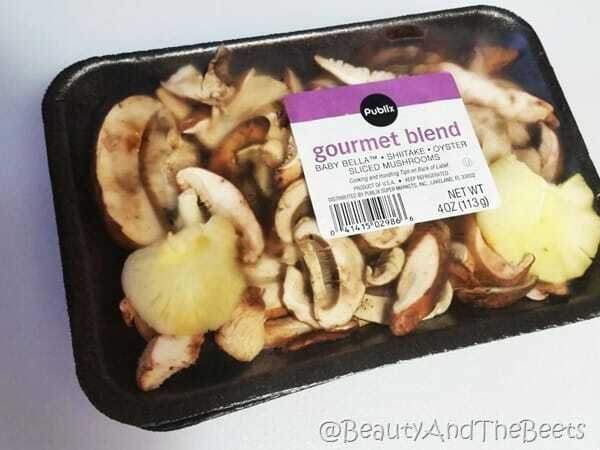 Just be sure to use juice that has no added sugar or your mushrooms will be very sweet. 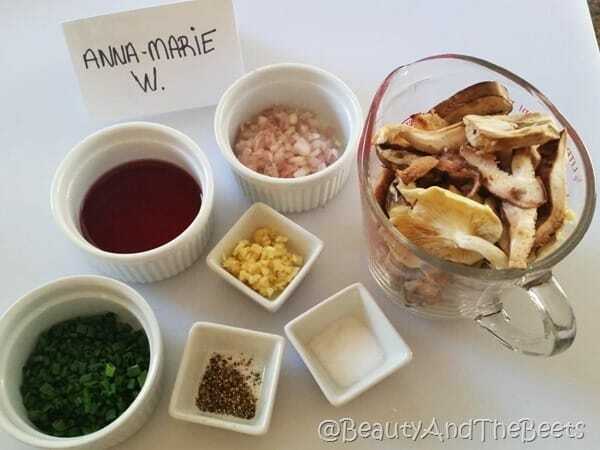 And the whole mushroom cooking process was real fast so the mise en place was very important. (Mise en place is the set up of all the ingredients in a dish for easy access during cooking.) And the mise en place is part of our grade for the class. Anyway, as I said, the mushrooms cooked very quickly so they went from raw to done in a matter of minutes. 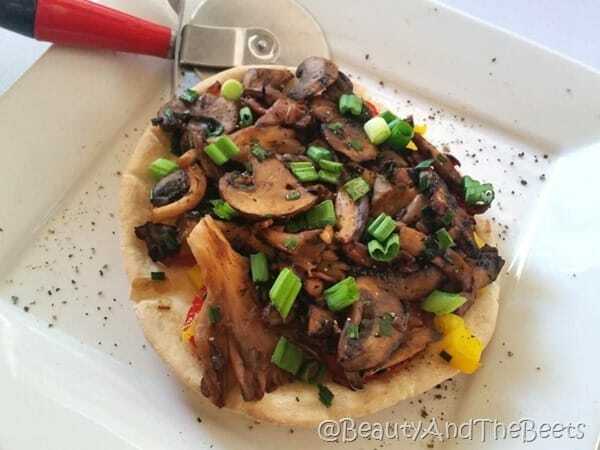 The end result was a plate of mushroom yumminess – I could eat them just as is – but I decided to make a pita pizza with them. I kept the other veggies simple as to not overshadow the garlic mushrooms. I used sliced tomatoes in place of sauce, added some yellow pepper for color, and added green onions as a garnish. Easy!! Begin to heat a large skillet over medium high heat. As the pan heats up***, check the temperature by adding a drop of water. When the water forms into a ball and rolls around the skillet, your skillet is hot enough. Add the shallots and stir continuously until you notice they begin to slightly stick. 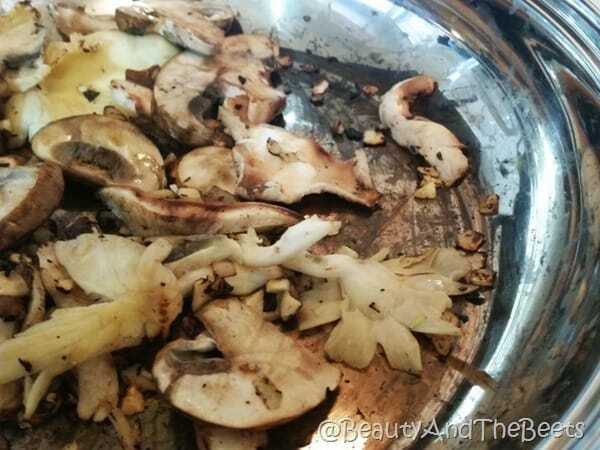 Add the mushrooms and garlic, continue to stir until the mushrooms begin to stick. Quickly add the juice and stir the mushrooms until the skillet is almost dry, about 2-3 minutes. Sprinkle in the chives and sea salt, remove the skillet from the heat. Layer the tomatoes and peppers on the pita bread. 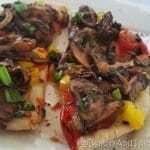 When the mushrooms are cooked, pile the mixture onto the layer of tomatoes and peppers. Sprinkle on the green onions and bake in the oven for 10 minutes, until the pita begins to crisp. Any mushrooms will work – shiitake, oyster, baby bellas, etc. *I used juice in place of wine, however, you can use masala wine or another deep red. *** It is important to make sure your pan in hot enough. To test on a stainless steel pan, drop a tiny amount of water onto the heated pan. 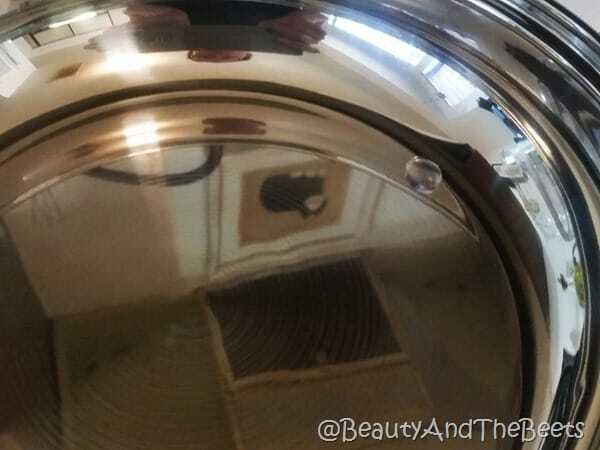 When the water forms a ball and rolls around the pan, your pan is ready for your ingredients. Naturally, if you have to add cheese, a finely grated parmesan would work well. Not the shaky can kind of cheese, like if you are going to take the time to make the garlicky shrooms then grate a block of Parmesan yourself. Have you ever had pizza without the cheese? 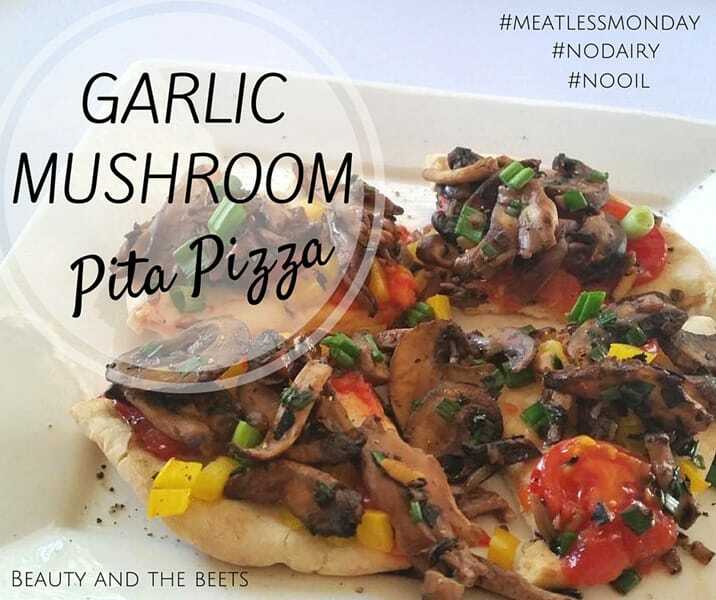 What is your favorite veggie on your pizza? Only when you move within a few miles of me and open the restaurant with me! !